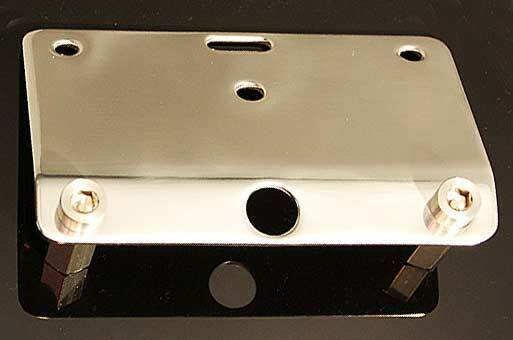 Our fender design allows installation on all VTX models, including 1300, 1800 VTX in R,S,N,T, F & C models. F model will require a R/S or N seat. This fender will accept tire sizes up to and including a 200mm on a 5.5" wide wheel. A very popular combination is a 18" diameter x 5.5" wide RC or Sumo-X wheel with a 200 tire. 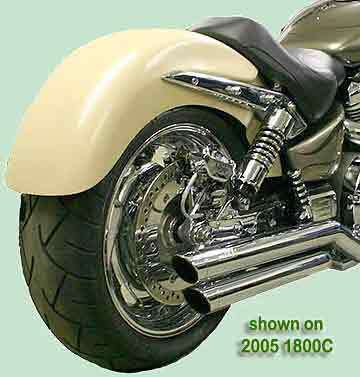 The photo with the available different lengths indicated shows this fender mounted on a 2005 VTX 1300R with a stock 170 x 15 rear tire. 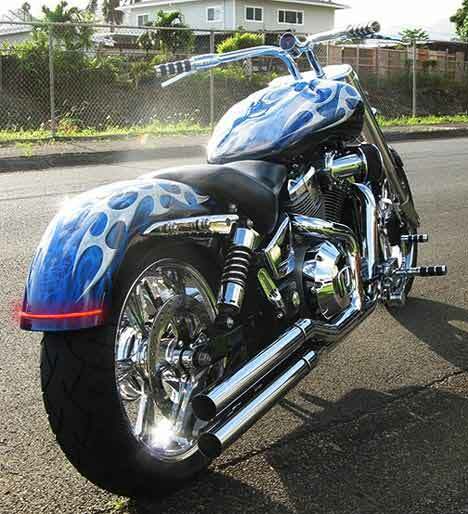 While this combination looks great, a 200 tire fills your fender even more (available here also). 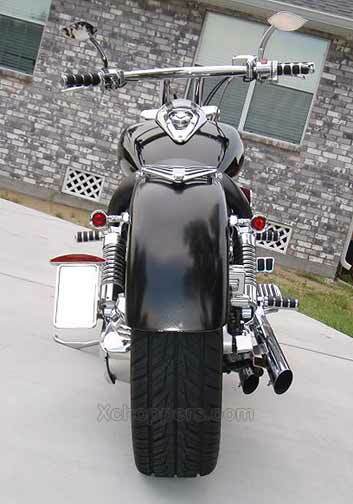 In either case, the way our fender hugs the tire makes your tire look much larger than with a stock VTX fender. Lowering your rear suspension with our shorter than stock rear shocks greatly increases the custom look with our X Sickles 200 fenders. With our X Sickles 200 fenders, you can upgrade to the cool styled, close fitting look before you even need to replace your rear tire. It looks great either way! 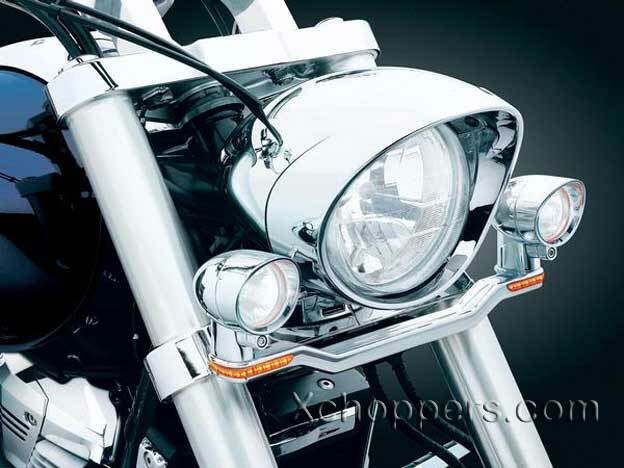 Say bye to the stock "motocross look" with our X Sickles fender! 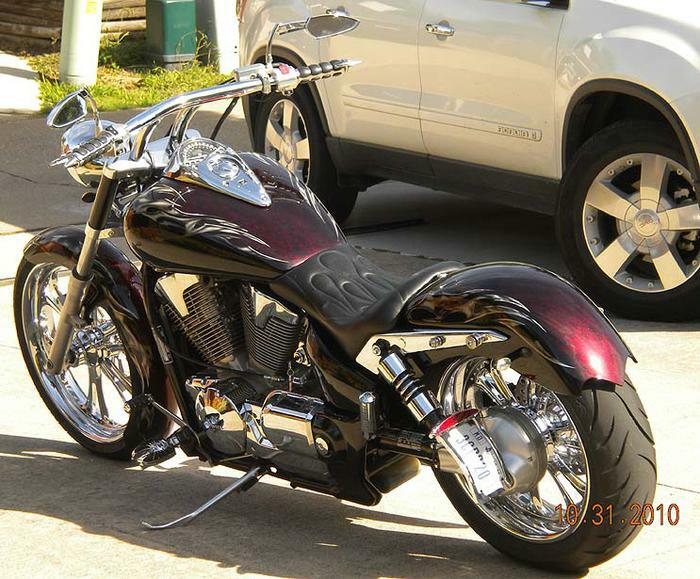 This one modification will completely change the appearance of your VTX and give a cool "Chopper/Pro Street / Custom" look! Most photos shown were taken with a shock eye to eye length of 10.5" or 11". The design of our fenders work well with any length shock but we strongly recommend our shorter length custom shocks (available in shocks, suspension, triple trees section). Our MB Products 10.5" shocks are the recommended choice. 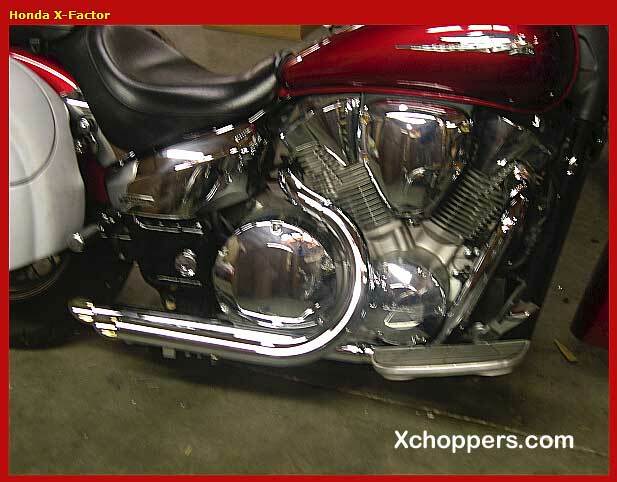 Xchoppers X Sickles 200 fenders allow fitting larger, non stock sizes (up to 200) much easier than with a stock fender because our fender is made extra strong and doesn't require the stock Honda under fender support, EVEN RIDING 2 UP! Our fenders are much stronger than the original VTX fender. Strength of our fenders is never an issue! ISO White gelcoat finish with 3 layers of 1 1/2 oz random fiber-glass matting hand laid for a sub-total of 4.5 ounces per square foot plus a complete finishing layer overall of 8 ounce woven oriented bi-axle laminate for extra strength for driver and passenger support, grand total of 12.5 ounce per square foot construction, pound for pound stronger than steel. 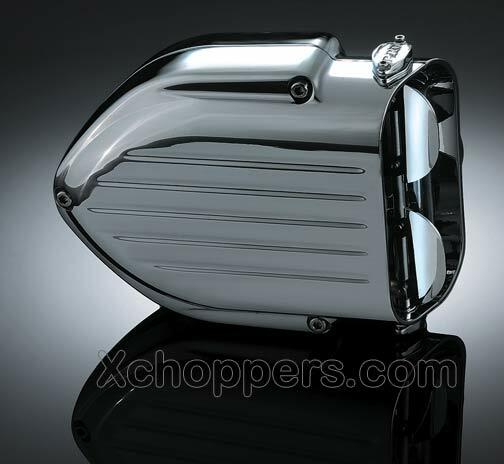 Xchoppers fenders do NOT limit the weight you can safely carry! Don't risk riding your passenger on a weak, inferior fender! Because our fender is exceptionally strong, the separate under fender support structure from Honda is not required for supporting your passenger passenger. Our High Quality Construction makes it unnecessary! 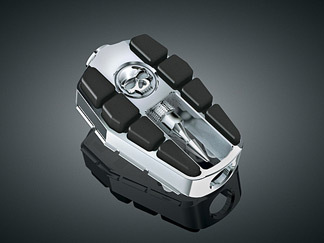 This is really a great feature for all as it eliminates any potential interference with your tire when riding with a lowered suspension as well as greatly simplifying installation of a 200 tire! All riders will be safely supported, 2 up or solo. 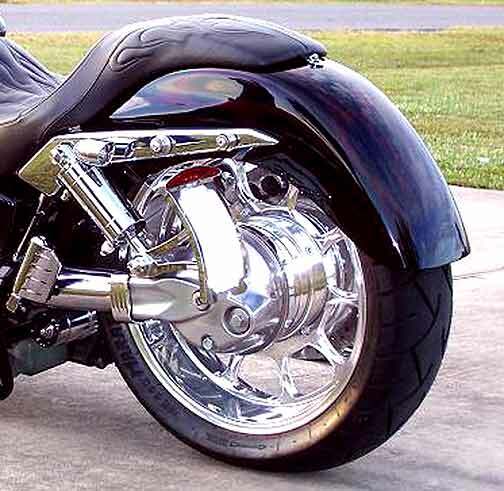 Go ahead and add saddlebags and a backrest if you choose. You can't break one of our fenders without running over it! Our fenders are designed for installation on all VTX models, including 1300, 1800 VTX's in all R,S,N,T, F & C configurations. 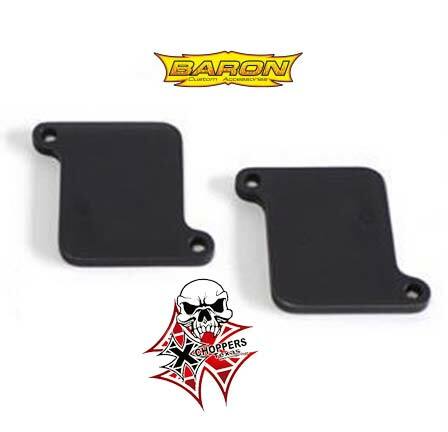 Stock and aftermarket seats designed for use with original Honda VTX fenders can also be used on our Xchoppers fenders in all applications other than a VTX 1800 F.
1800 F models require a R/S or N style seat when used with our Xchoppers fenders. 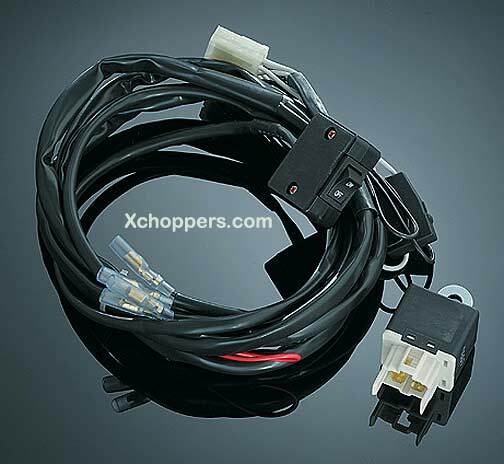 This is required due to the special requirements of the F model which is unique to the VTX line. These guidelines cover stock seats, solo designs and all 2 up seats, Touring and sport styles alike. 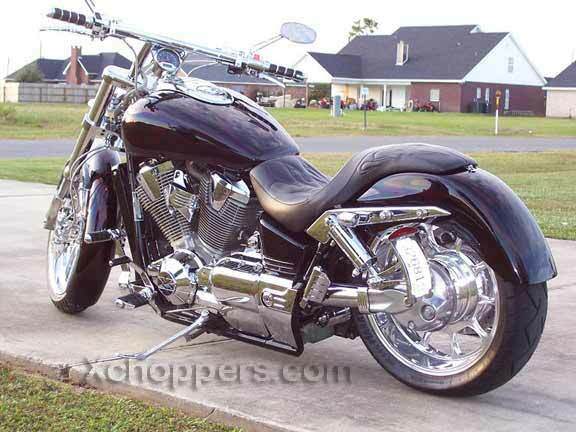 With our Xchoppers fenders and custom struts, there is no need to immediately buy an after market seat in order to use your new X Sickles fender. That way, you can delay the expense of purchasing a custom seat until later, if you decide you want one. No limitations on rider or passenger weight ! The stock Honda under fender support can sometimes be a problem when upgrading to a wider tire. It can sometimes require trimming to clear the sidewalls with a 200 tire. 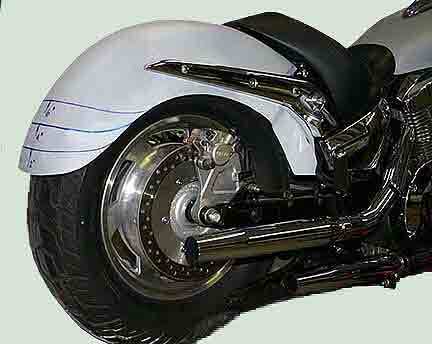 The stock Honda under fender support IS NOT USED with our X Sickles Fenders. 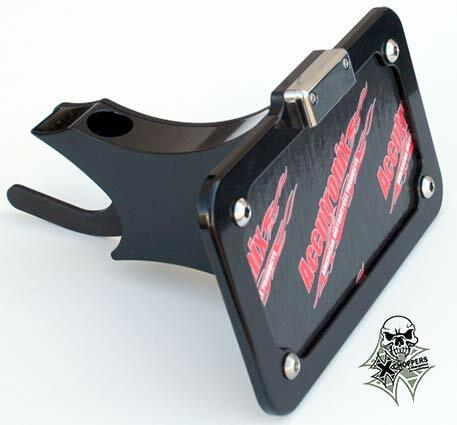 Our Xchoppers fenders DO NOT REQUIRE ANY ADDITIONAL SUPPORT! FITTING A 200 TIRE IS EASY, EVEN WITH our 10.5" SHORT (MB Products) SHOCKS OR AIR SUSPENSION! 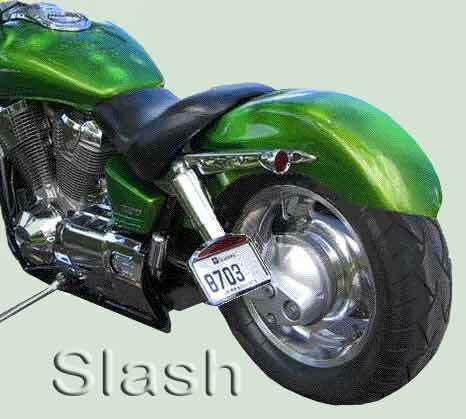 Please notice that our standard length fender extends low in the rear which allows you to trim the length or cut any point design/shape you may want, if a special look is desired. Fiberglass can be trimmed with a saber saw or electric drill with a sanding disc or drum attachment. To have us cut the length you want, please specify your choice by clicking on the options desired. NOTE: Fenders with custom cuts are NOT RETURNABLE. PHOTO SHOWS DIFFERENT LENGTHS AVAILABLE. PLEASE CALL US FOR MORE INFORMATION ABOUT THESE LENGTHS AND OPTIONS. 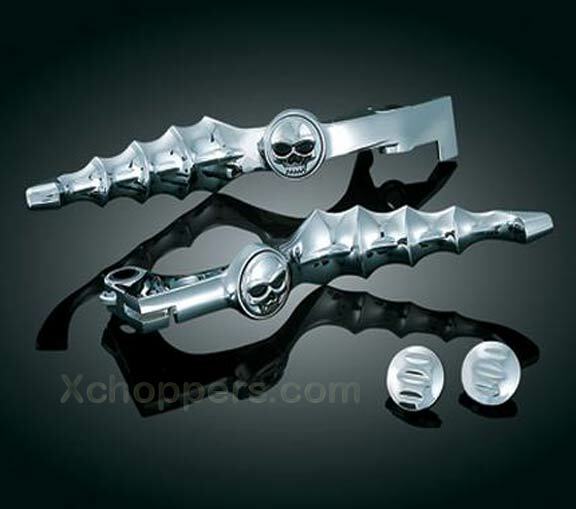 Xchoppers X Sickles 200 in full length (standard length) version. Can be cut to any length that suits your needs or we'll do it for you before we ship. (see options below). 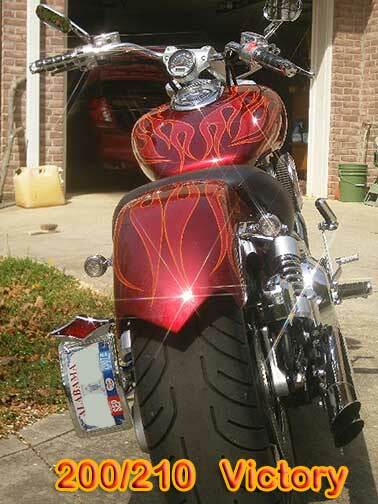 Photo above shows Michael Hall's VTX 1300 C with our X Sickles 200-6 rear fender and optional Xchoppers LED tail light installation. The red light blends in with the red paint to where you almost don't see it. 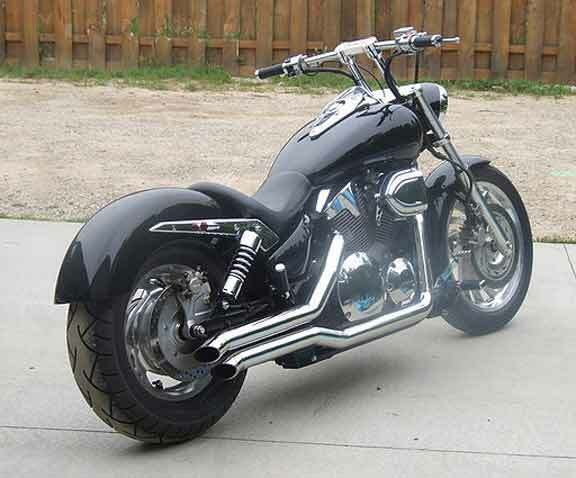 Note with a X Sickles 200-6 or -7 we strongly recommend use of no longer than a 10.5" rear shock length. See our 10.5" shocks made by MB Products. All of our X Sickles fenders will look best with our MB Products 10.5" shocks but 11.0" shocks will also fit nicely as well. Shocks longer than 11.5" will also work but are not recommended due to excessive space between the tire and fender (for appearance reasons only). 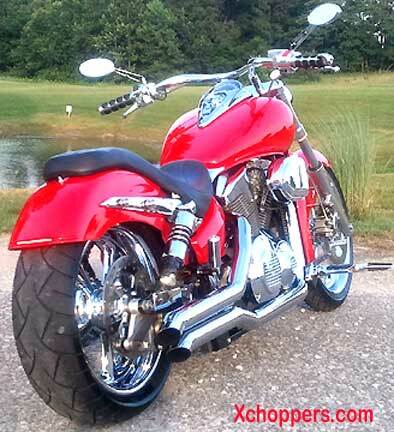 X Sickles 200 rear fender on Honda VTX 1300 with 205/65/15 car tire. Jared Angell's VTX1300R shown above with a car tire on a VTX 1800F wheel. 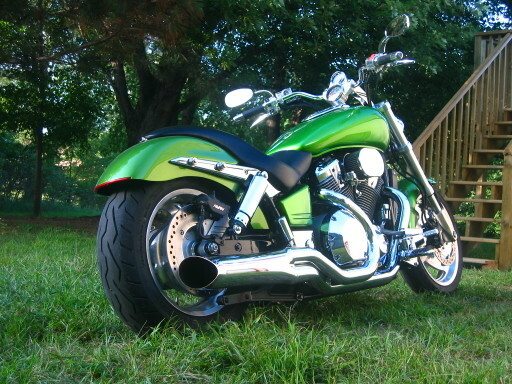 X Sickles 200 shown is standard (full length). To see shipping options, add your items to the shopping cart and enter your zip code. You will not be charged until you have approved your order. This fender is plainly awsome! With minimal bodywork it was ..